Nedbank is the smallest of South Africa's big 4 banks. 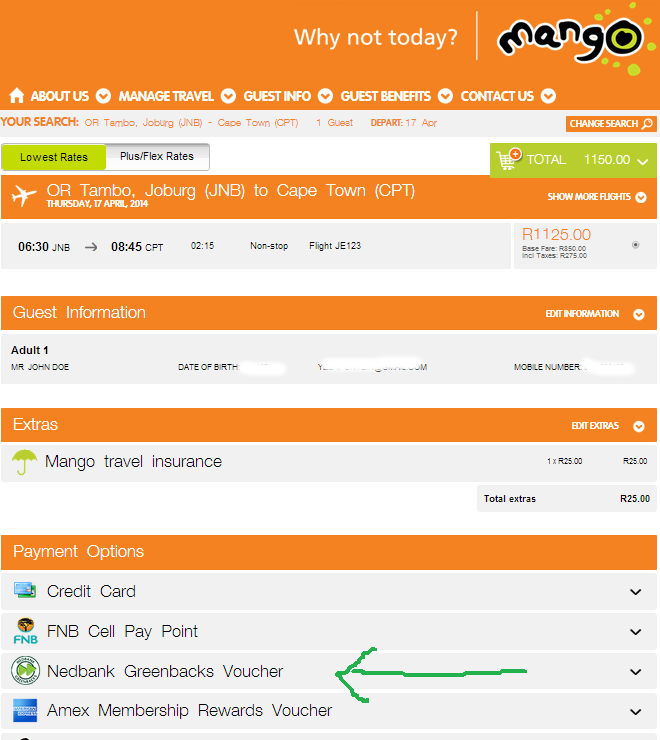 Did you know that you can book Mango flight with Nedbank Greenbacks (the points you earn on your credit card). Nedbank normally adjusts its banking charges in July. Tom Boardman is expected to retire, as he has reached Nedbank's retirement age of 60. Nedbank announces that it is to absorb "Go Banking", a joint venture with Pick 'n Pay which allowed cash withdrawals and deposits at the retailer, into its main operations. The Nedcor Group is renamed the Nedbank Group. BoE, Cape of Good Hope Bank, Nedcor and NIB are combined into a single legal entity - Nedcor Group. Nedbank acquires Robert Fleming & Co, an Isle of Man & Jersey private banking company. A bid for merging with Standard Bank fails. An office is opened in Beijing. The name changes to Nedcor Bank Limited, with Nedbank being the largest division. The first drive-in ATM is opened in Cape Town. An office is opened in New York. Nedbank Limited, Syfrets South Africa and Union Acceptances Limited merge to form the Nedbank Group Limited. The NBSA (Netherlands Bank of South Africa) changes its name to Nedbank Limited. Computerised banking services are introduced. The head office is moved to Johannesburg (81 Main Street). First branch in South West Africa/ Namibia is opened. The Netherlands Bank (NBZA) is formed as a South African banking company and its name is changed to the NBSA (Netherlands Bank of South Africa). The NBZA's headquarters are moved to Pretoria, and all the NBZA's assets are transferred to South Africa. The bank merges with the Transvaalsche Bank en Handelsvereeniging. Branches are opened in Bloemfontein and London (Great Winchester Street). The NBVC changes its name to the NBZA (Nederlandsche Bank voor Zuid-Afrika). The NBVC opens a branch in Cape Town. A wholly-owned subsidiary, the Pretoria Mortgage Company, is formed. The NBCV issues banknotes for the first time. The NBCV opens offices in Potchefstroom and Johannesburg. The NBCV opens its doors for business in Church Street, Pretoria. Its starting capital is a hundred thousand rand. The NBCV (Nederlandsche Bank en Credietvereeniging) is established in Amsterdam under the framework of a Royal Charter.